The Lanier Theological Library has on display a facsimile of the only Dead Sea Scroll written on metal. It was loaned to us by Ecole Biblique, the French School of the Bible and Archaeology, in Jerusalem. 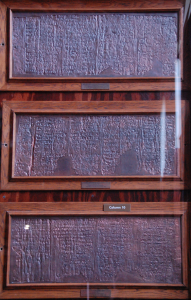 This copper scroll was discovered in Qumran Cave 3 on March 20, 1952. Originally on 2 sheets of copper riveted to be about 8 feet long and rolled tightly, it had to be cut into 23 small sections for analysis. It is the work of a single scribe between 25 and 75 AD. In our display it is shown in three frames. Its Proto-Mishnaic Hebrew is difficult to translate, but it lists 60 or 61 locations where over 100 tons of gold, silver, scrolls and priestly items were hidden, primarily in the areas surrounding Jerusalem and Jericho. Some scholars believe it is a factual list of treasure, while others think the list is fictional. Professor Emile Puech who published the latest study believes the list is real and the treasures belonged to the Essenes. He thinks it was hidden in the cave just before the Romans arrived in the Jericho area in 68 AD. A few small caches of money on this list have been found, but for the most part expeditions to find the treasure have proved unsuccessful. This display is to your left as you enter the front door of the library, hanging on the wall at the east end of our Isaiah Scroll display. We are very grateful to Weston Fields, Director of the Dead Sea Scrolls Foundation, for making this loan possible.